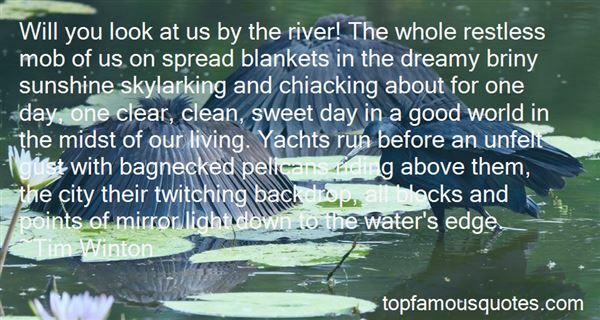 Reading and share top 3 famous quotes and sayings about Pelicans by famous authors and people. Browse top 3 famous quotes and sayings about Pelicans by most favorite authors. 1. 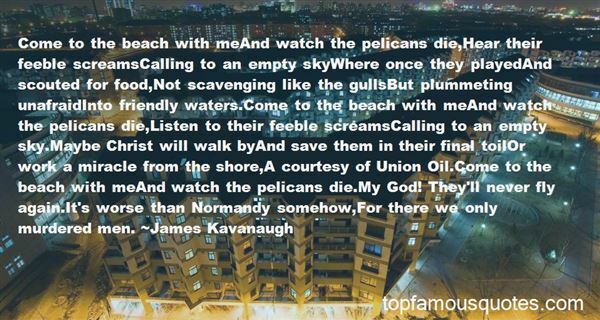 "Come to the beach with meAnd watch the pelicans die,Hear their feeble screamsCalling to an empty skyWhere once they playedAnd scouted for food,Not scavenging like the gullsBut plummeting unafraidInto friendly waters.Come to the beach with meAnd watch the pelicans die,Listen to their feeble screamsCalling to an empty sky.Maybe Christ will walk byAnd save them in their final toilOr work a miracle from the shore,A courtesy of Union Oil.Come to the beach with meAnd watch the pelicans die.My God! They'll never fly again.It's worse than Normandy somehow,For there we only murdered men." 2. "Why, Jon, why?" his mother asked. "Why is it so hard to be like the rest of the flock, Jon? Why can't you leave low flying to the pelicans, the alhatross? Why don't you eat? Son, you're bone and feathers!" 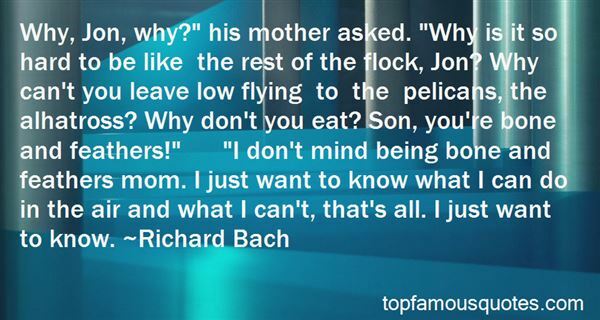 "I don't mind being bone and feathers mom. I just want to know what I can do in the air and what I can't, that's all. I just want to know." 3. "Will you look at us by the river! The whole restless mob of us on spread blankets in the dreamy briny sunshine skylarking and chiacking about for one day, one clear, clean, sweet day in a good world in the midst of our living. Yachts run before an unfelt gust with bagnecked pelicans riding above them, the city their twitching backdrop, all blocks and points of mirror light down to the water's edge." Rainer Maria Rilke greeted and wrestled with the angels of his Duino Elegies in the solitude of a castle surrounded by white cliffs tall trees and the sea. I greeted most of mine in the solitude of a house that still vibrated with the throbs of a singular life that had helped shape many lives and with the ache of attempts to render useful service to that life. The River of Winged Dreams was therefore constructed as a link between dimensions of past and future emotions and intellect and matter and spirit."